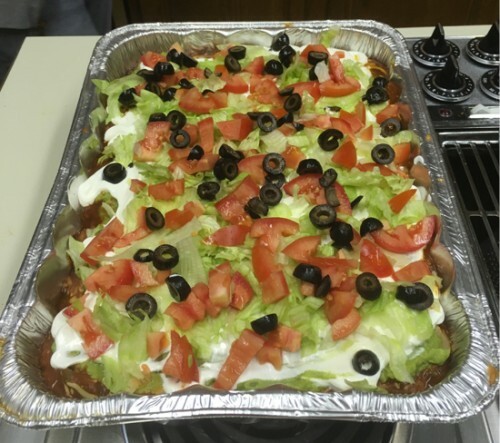 Fantastic Burrito Casserole – Naturally Gluten-Free and with Vegan Options! Summary: We invented this burrito casserole, and so many people have asked us for the recipe that we decided to write it up for everyone! It's sort of like a 'Mexican lasagna' (or 'lasagne', if you prefer) We like to serve it with a side of salad and some cornbread! We invented this burrito casserole, and so many people have asked us for the recipe that we decided to write it up for everyone! It’s sort of like a ‘Mexican lasagna’ (or ‘lasagne’, if you prefer) We like to serve it with a side of salad and some cornbread! Grease a a large baking pan, such as you’d use for lasagne, and set aside. In a large skillet, cook the chopped onion in the oil until translucent. Add the crumbles and cook until heated throughout. Then add a small amount of the enchilada sauce (just to make the crumbles not so dry) and the taco seasoning, and mix well. Remove from heat. Put down a thin layer of the enchilada sauce in the greased lasagna pan (this is to keep the tortillas from sticking to the pan). Next lay down a layer of tortillas, breaking one into pieces to fill in between so the bottom is (mostly) covered. Now cover the tortillas with another thin layer of enchilada sauce, and then a layer of the crumbles mixture. Sprinkle the black olives on top of the refried beans. Now repeat the entire process, so a layer of tortilla, then enchilada sauce, then crumbles, cheese, refried beans, and olives. After the last layer of beans and olives, put down a last layer of cheese, and then cover the pan with foil (crimp the edges under so that it is sealed) and bake at 375 for 45 minutes. Once the pan is in the oven, take the sour cream and guacamole out from the fridge and let them stand on the counter to warm up for a bit, while you shred the lettuce and chop the tomatoes. When the casserole is done baking, remove from oven and place on rack to cool for 15 minutes – leave the foil on. Once the casserole has sat for 15 minutes, remove the foil, and spread the guacamole on top of the casserole. Then spread the sour cream on top of the guacamole. Finish by sprinkling lettuce on top of the guacamole, and the tomato on top of the lettuce. Serve warm. If you have any leftover lettuce and tomato, put it in bowls on the table for people to add on top if they like. By the way, this Burrito Casserole, like lasagna, will firm up as it cools, and is even better the next day!